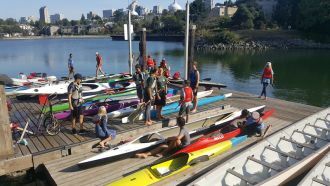 We have many exciting Youth paddling options to help keep your kids active! Our youth paddling programs are structured based off the nationwide Canadian Sport For Life Long-Term Athlete Development model, and more specifically, the CanoeKayakCanada LTAD Model. This model is designed to help kids develop optimally through stages, acquiring fundamental skills and progressively building on their technical and physical skills. Kids can enter our programs many ways depending on how much paddling they want to do! We have Intro programs for those who only want to paddle once a week. We have Racing programs for those who want to paddle more and do some racing. And we have our Summer Camp programs! Note: our racing programs also include the summer camp options already. All of our programs are designed to optimize age-appropriate learning and physical developments. Our younger-aged programs are all about setting the right foundations for kids in terms of skills, body coordination, fitness, etc. while having lots of fun. And as they get older, can continue to further refine their abilities, and perhaps train at a more competitive level if they want!